Designed specifically for tank cars and other freight cars loading or unloading hazardous materials, and where a spark from a steel wheel chock could ignite dust or fumes. Urethane is truly the Miracle Material — combining great resistance to loads with the ability to compress to half of its thickness and then spring back to its original shape. Urethane will not degrade from corrosive materials and most chemicals. 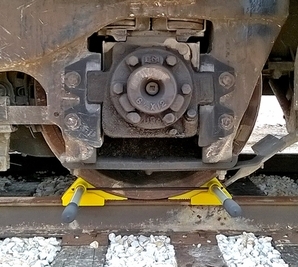 SPARK-PROOF Urethane Wheel Chocks are tough enough to block a tank car, but resilient enough that the car can be pulled over the chock by a locomotive without derailing. No more trying to yank free a steel chock that is stuck under a wheel. When it’s time to move, just pull the car over the chock and retrieve the chock later. The SPARK-PROOF chock was successfully tested at the Association of American Railroad’s testing facility at Pueblo, Colorado and then at a shortline railroad. • 4” high, ideal for chocking locomotives. • Available in exposed rail or flush rail version. • Handles are 24” long. When installed on flush rail, the handles are 1-1/2” above the pavement for easy grasping.